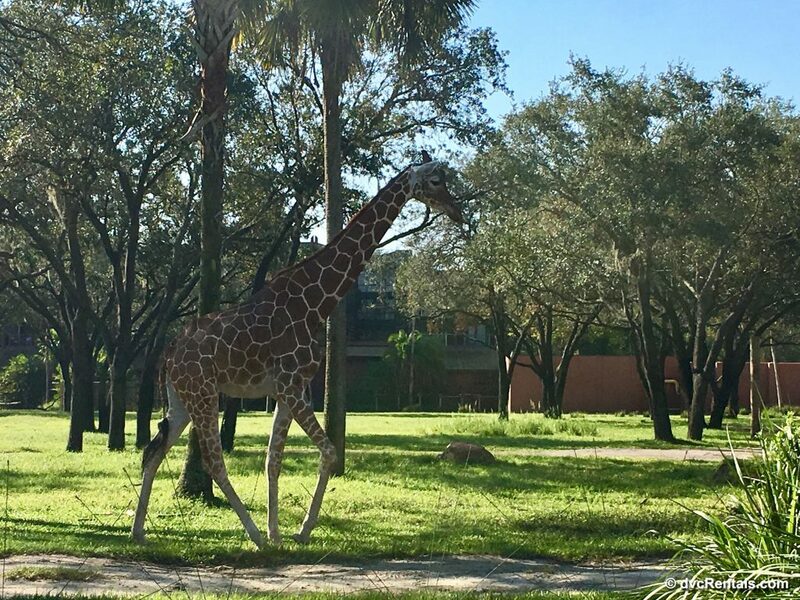 Keeping Up With Kidani – All about the Animal Kingdom Villas - Kidani Village! 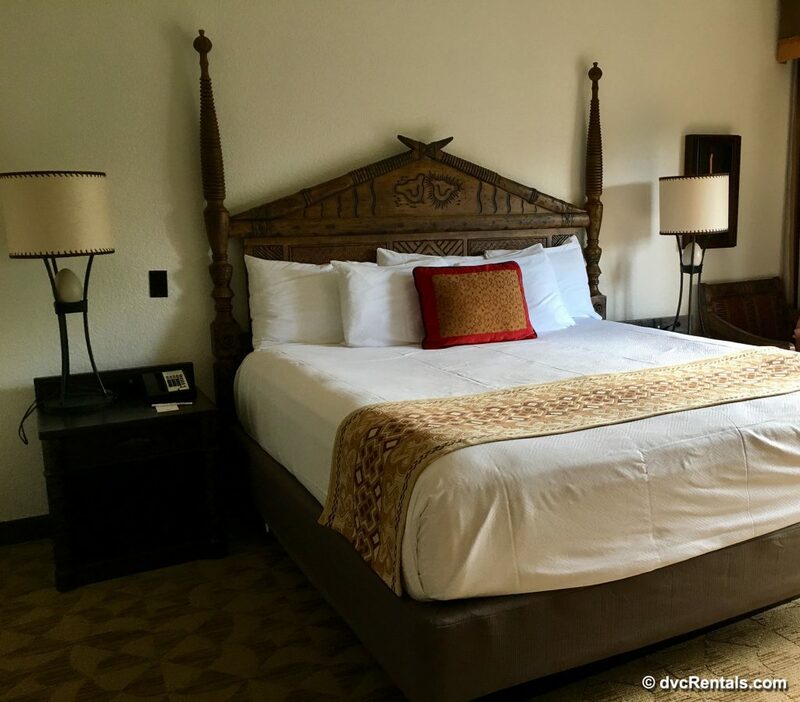 Welcome to Walt Disney World’s Animal Kingdom Villas – Kidani Village! 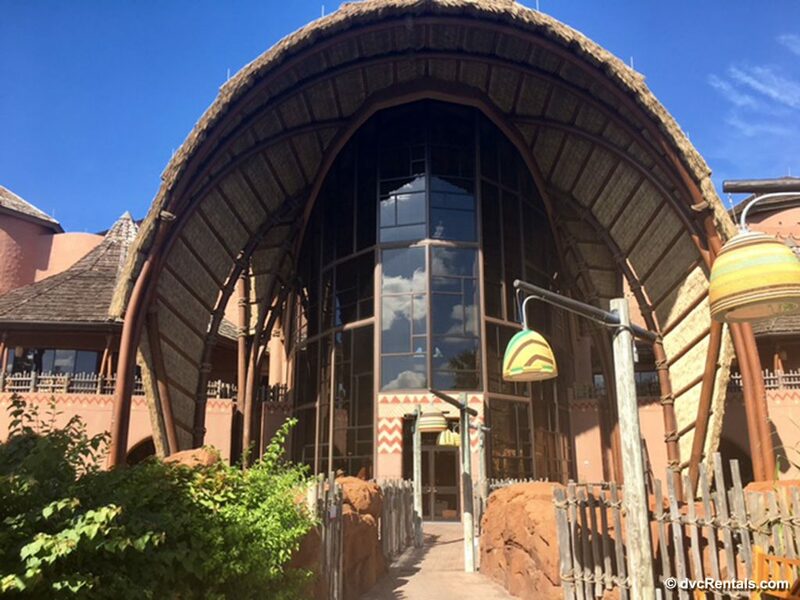 This stunning DVC resort magically transports guest to a luxurious African lodge and has a ton of amazing features, so let’s grab our safari gear and start exploring! The main entrance to Kidani is simple but special! 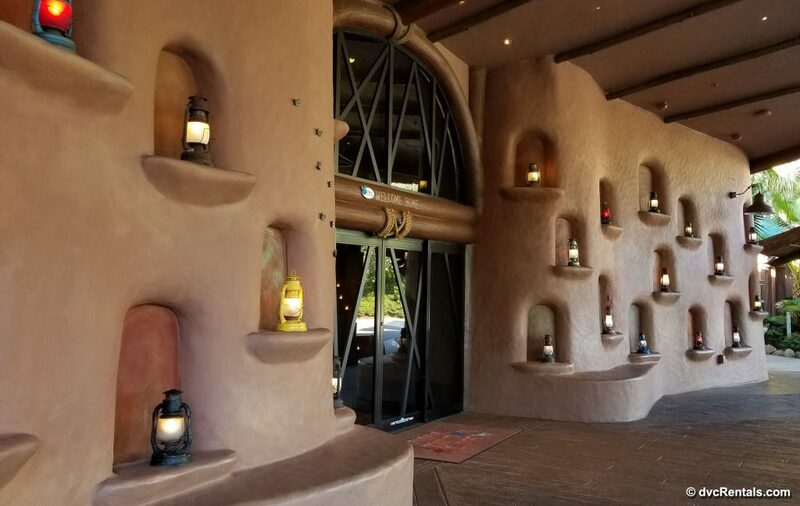 The walls surrounding the main doors to the lobby are decorated with dozens of multi-colored lanterns, immediately giving guests the impression that this is an oasis for visitors during their adventures on the African savanna. The lanterns are particularly beautiful when lit up in the evening and cast a warm, welcoming glow for those returning from their park explorations! 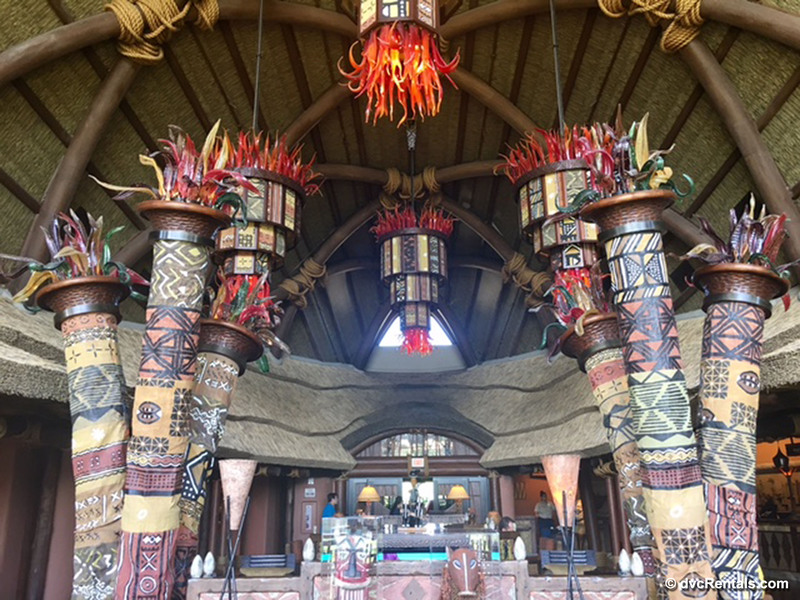 Though the lobby at the Kidani Village area of the Animal Kingdom Villas is smaller than that over at Jambo House, it still packs quite a punch! 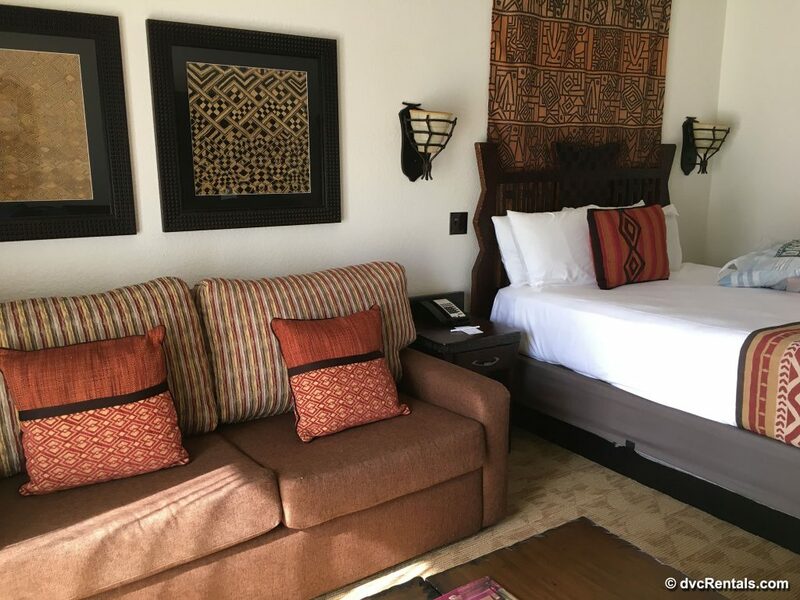 Guests here are surrounded by rich, dark woods, and beautiful African art. The lobby is also home to some very cool artifacts that are worth checking out as you’re checking in! 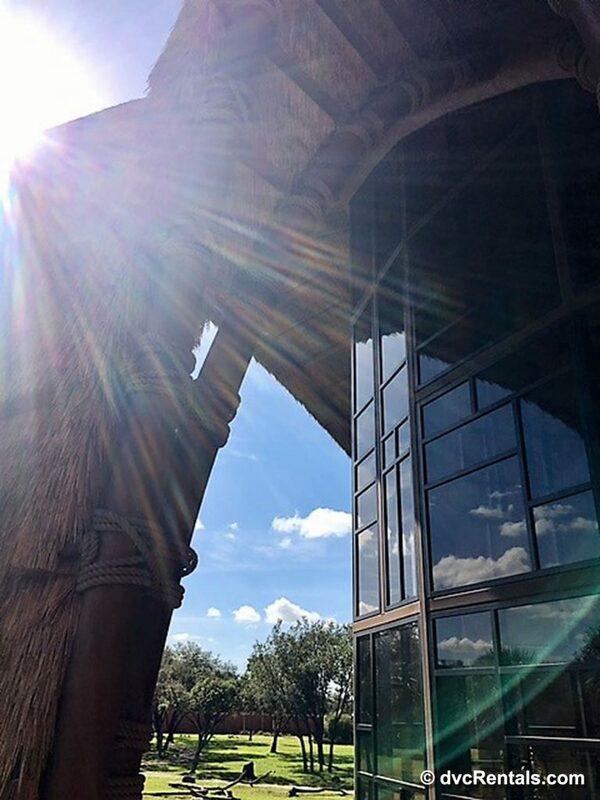 My favorite feature of the Kidani Village lobby is the wall of windows at the far end of the lobby that offers visitors their first glimpse at the savannas surrounding the resort grounds. 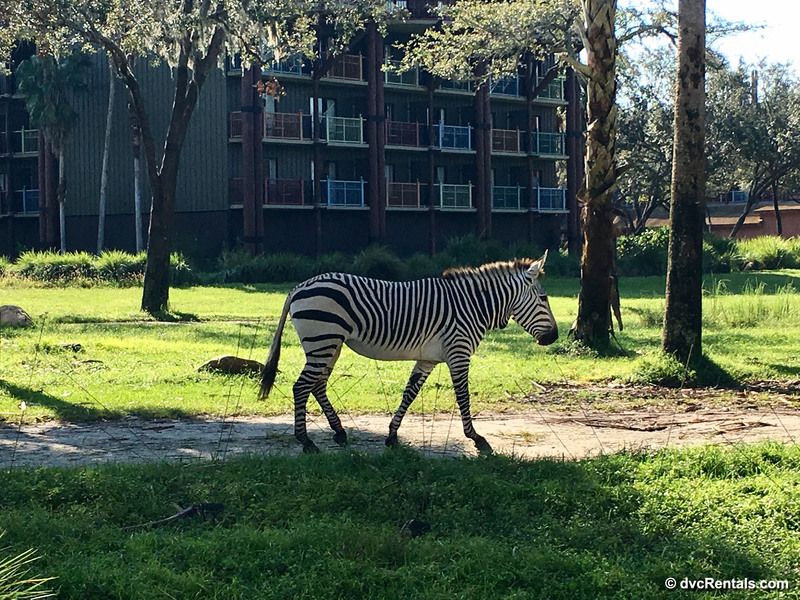 It is truly incredible to begin your Disney vacation by seeing a Zebra from the check-in desk! 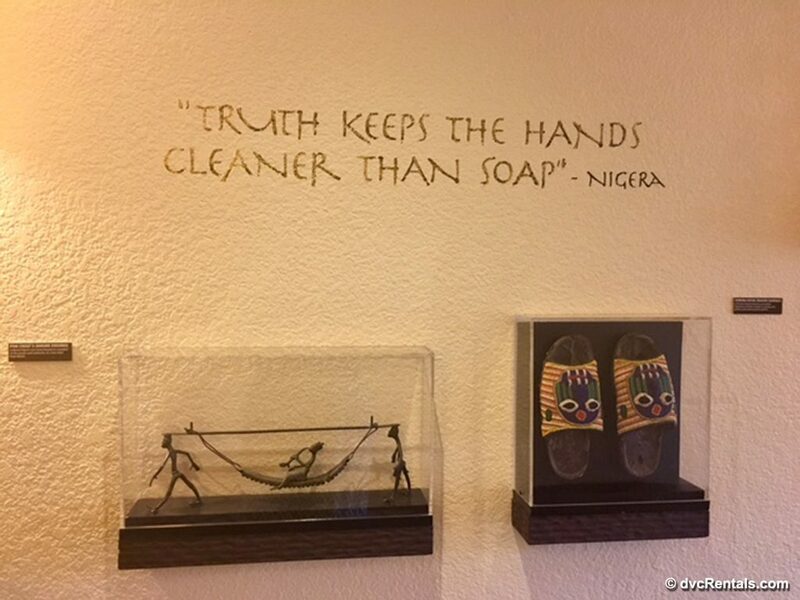 Another of my favorite design features found throughout the resort are the African proverbs and inscriptions on walls in various public areas, including hallways, and by the pool. I love that Disney always wants to impart a good message to their guests while they have fun! Sanaa is a well-loved Disney restaurant, which offers amazing views of the Sunset Savanna, as well as delicious and savory African-Indian fusion dishes. At breakfast time you will find a casual quick-service sampling of options; however, lunch and dinner are where this location truly shines! 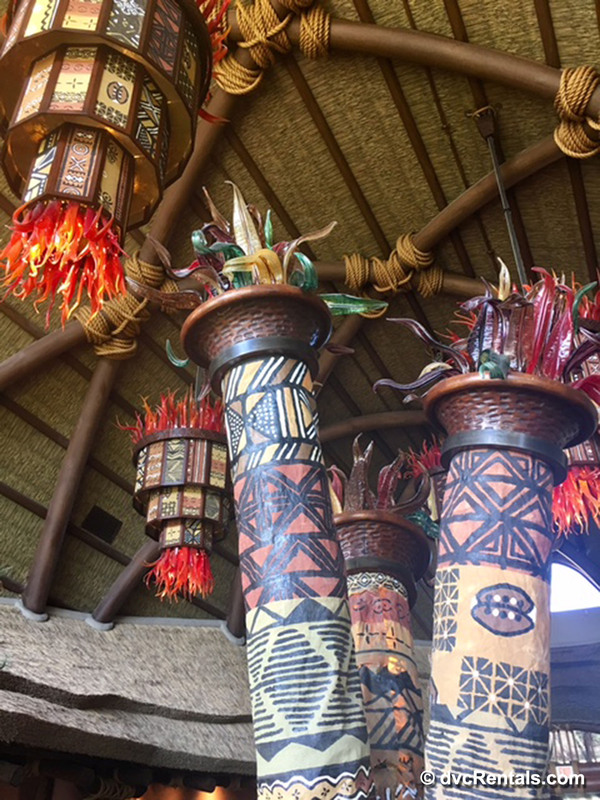 The décor is elegant yet colorful and lively, and you can tell the Imagineers who designed and decorated the space paid an incredible amount of attention to detail. Combine the magical ambiance with the floor to ceiling savanna windows, and you have an experience that is unforgettable – the food is pretty good too! 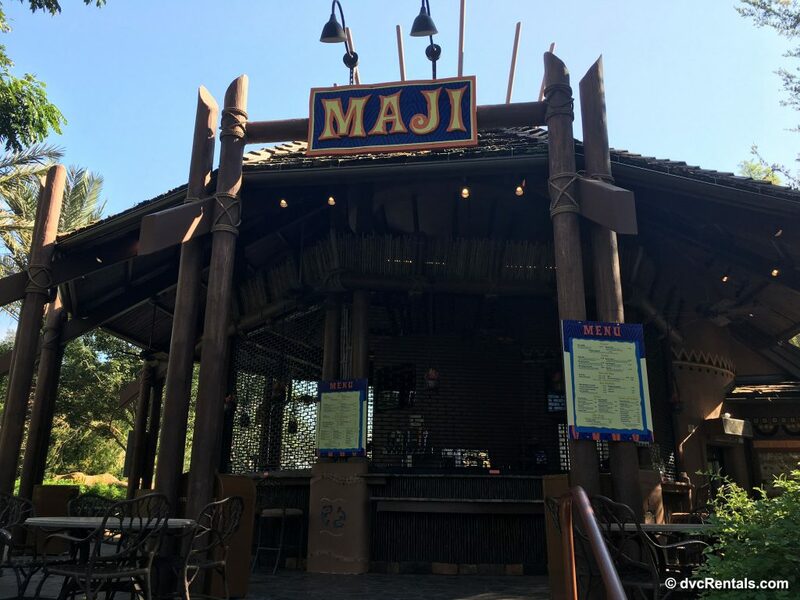 Guest can also quench their thirst (and hunger) at the Maji Pool Bar located at Kidani’s Samawati Springs pool. Here you’ll find snacks, sandwiches, smoothies, as well as several beverage options (including some delicious cocktails for those over the age of 21)! If you’re a shopaholic like me, you can get your fix at Johari Treasures! The gift shop here at Kidani Village is located in the main lobby and is also where you can top up your refillable resort mug! 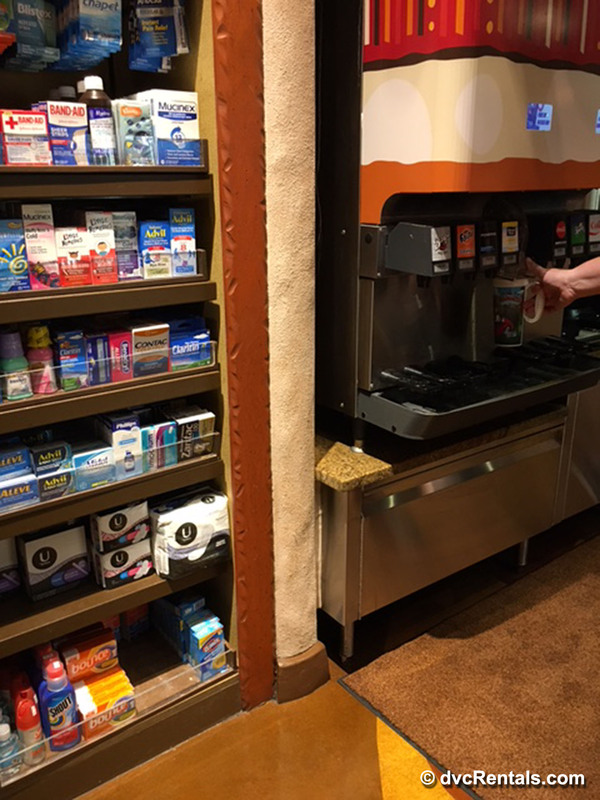 Here you’ll find your average resort sundries (sunscreen, travel packs of over the counter medications, etc. ), as well as resort-themed souvenirs. 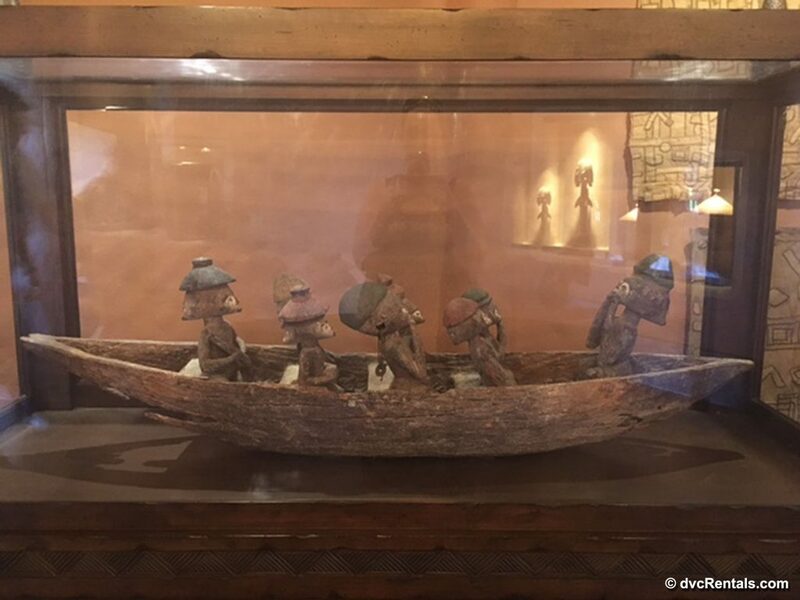 There are the usual Disney offerings of course, but also unique African crafts which can be a nice memento of your stay! 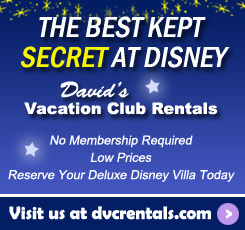 Kidani Village features many varied activities, and there is truly something here for everyone! If you’re looking for a trip that is heavier on time spent enjoying the resort rather than the parks, this would be my top recommendation! Guests of the resort will find the usual sporting, fitness, and arcade offerings found at most Walt Disney World resorts, however, my personal favorite at the Animal Kingdom Villas was the evening campfire. Guests and resort Cast Members would gather around the flickering flames and share stories and s’mores! There are also Movies Under the Stars screenings at the Samawati Springs pool which are a long-time favorite of mine. 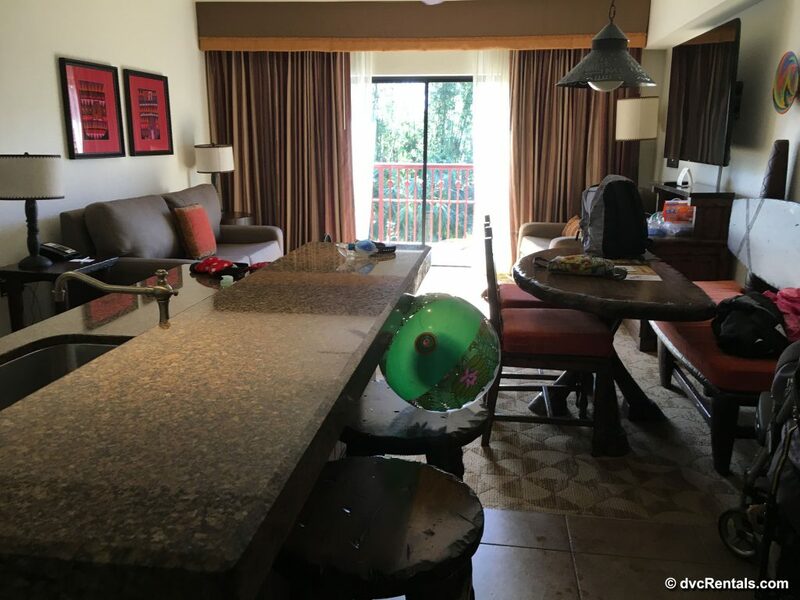 You’ll also find a Community Hall at Kidani Village where additional activities such as table games, crafts, games and more can be found. 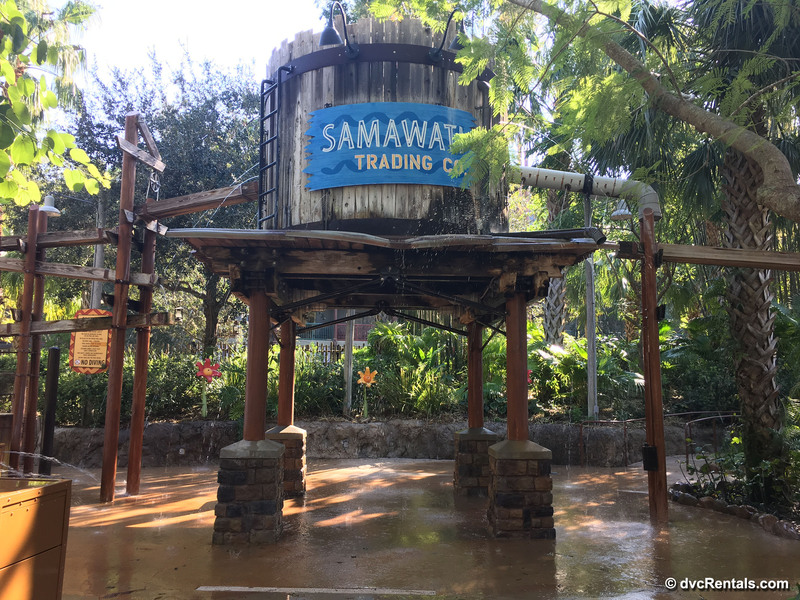 The Samawati Springs pool is one of my favorite pool areas at Walt Disney World! This is a perfect place for guests to splash the day away and take a watery respite from the savanna sunshine. 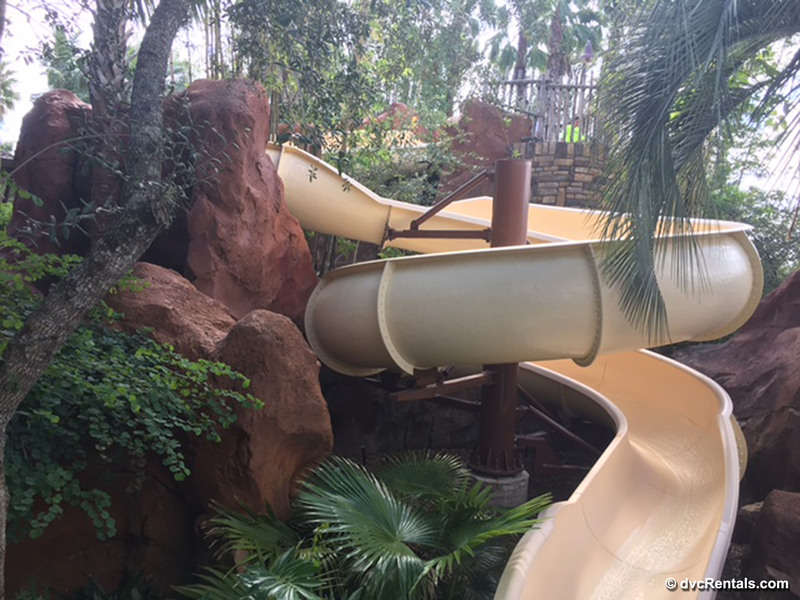 Samawati Springs features two waterslides – a mini-slide for toddlers and small children, and a larger slide with plenty of twists and turns for more adventurous visitors. You’ll also find plenty of comfy loungers for those who want to soak up the sun, and a water-soaked splash pad perfect for kiddos to cool off have some fun! Samawati Springs is also an afternoon party destination! 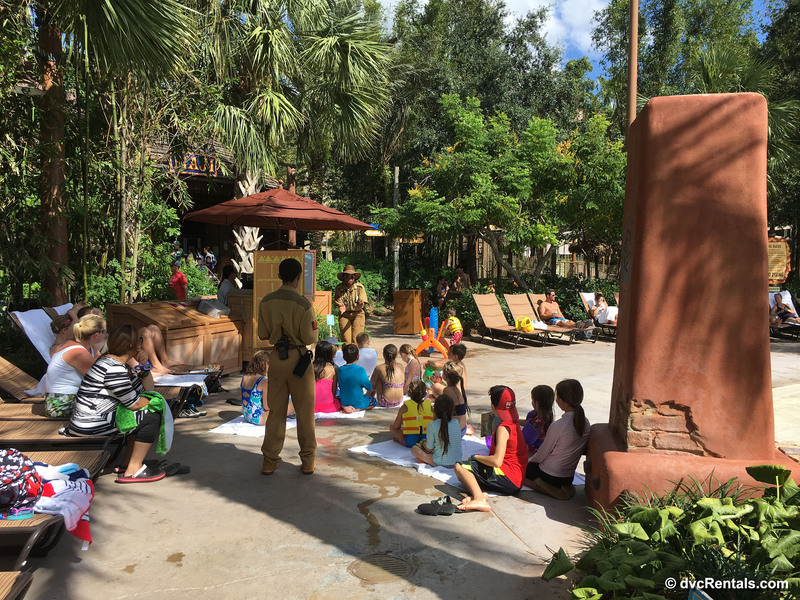 The resort Cast Members join guests for several poolside activities such as games and dance parties. This kept the kids I was traveling with occupied for hours! Their favorite game was a scavenger hunt where they had to retrieve Disney-themed items from the gear their family had at the pool with them (such as pins, sunscreen, a flip-flop, etc.) in their beach bags. The winners received small novelty beach balls for their efforts, and it was lovely to see the children all share their prizes and play together! Kidani Village offers bus transportation to help guests make their expeditions to all four theme parks, Disney Springs, and the waterparks. Travel times to the parks can vary, however when it comes to the Animal Kingdom park, we arrived in less than 3 minutes! We took advantage of some of the longer bus rides to allow the morning coffee to get the caffeine flowing and do some last-minute itinerary tweaking, or to rest our tired feet and minds at the end of a long day. I would say the lengthiest drive-time we experienced was about 30 minutes to the Magic Kingdom, though this was early in the morning at peak traffic time. 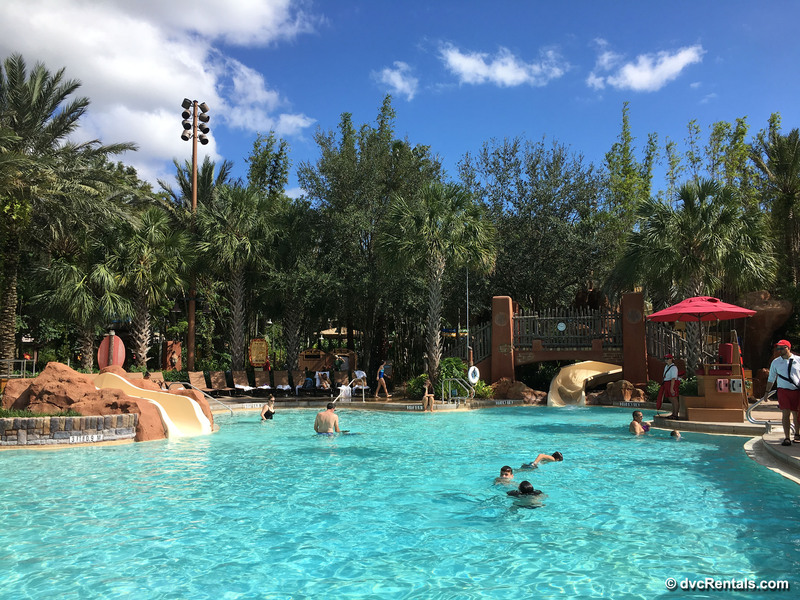 Overall, we had wonderful experiences with the transportation at Kidani Village, and never found ourselves with a long wait for a bus to arrive and whisk us away to our next destination! Along with the bus transportation to the parks, guests staying at the Animal Kingdom Villas can also take advantage of the complimentary shuttle that takes guests from Kidani Village to Jambo House (and vice versa). At each main entrance, there is a sign designating a pick-up location, and a van soon arrives to take you to the other building. 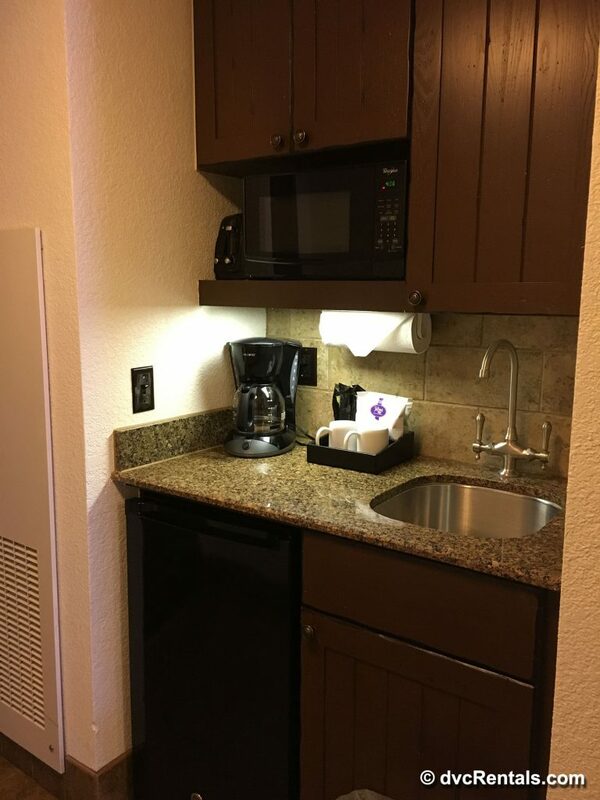 This is a wonderful convenience, as guests staying at the resort are welcome to take advantage of the recreation and amenities at both Kidani Village and Jambo House! The ride was short and enjoyable, and on my most recent trip we also had a fun Disney singalong with the Cast Member driving us! 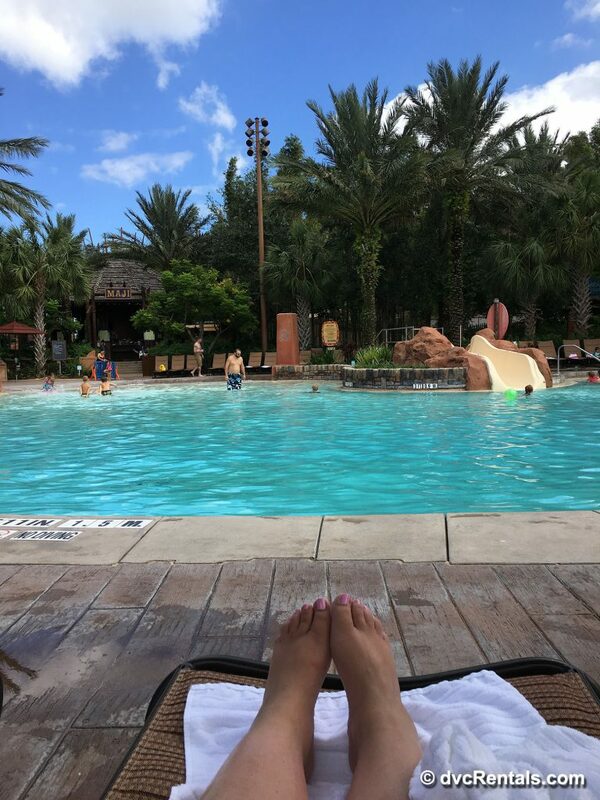 After a long day of adventures in the theme parks, it is wonderful to have a comfortable and cozy place to rest your head (and feet)! 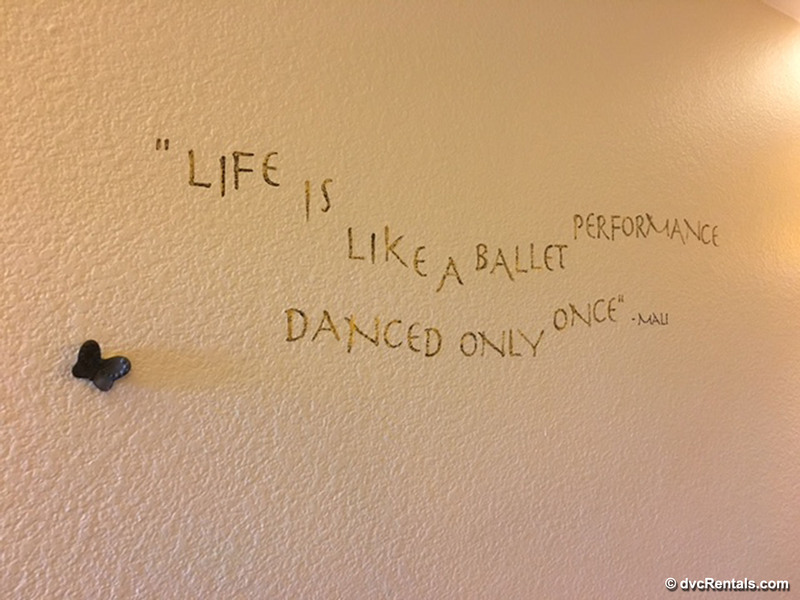 The Animal Kingdom Villas – Kidani Village DVC rooms are tastefully decorated with cream-colored walls, dark woods, splashes of red and orange, and African carving details featuring favorite friends from the Lion King. Simba, Rafiki, Timon, Pumbaa and more can be found all around the resort, including your villa! I stayed in a Two Bedroom lock-off villa (a combination of a One Bedroom and Studio) during my most recent visit and there was plenty of space for the seven of us in my travel party. 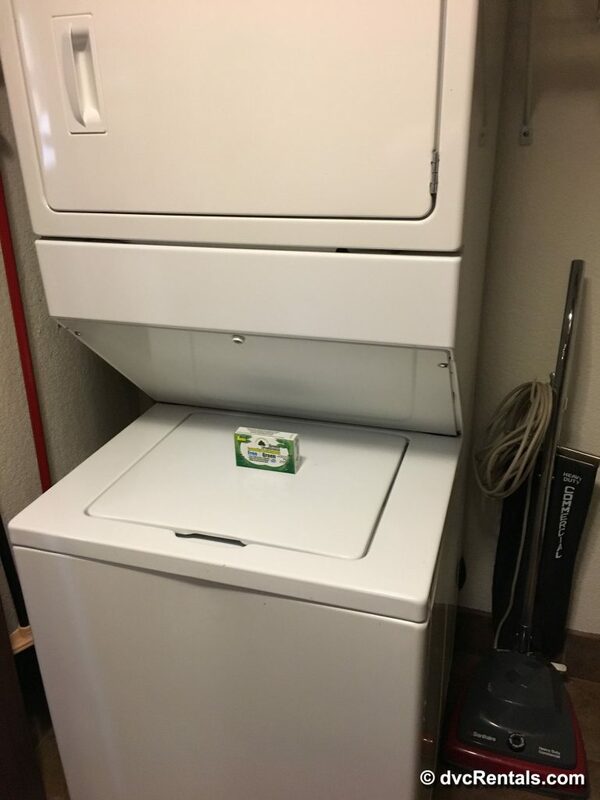 There was a full kitchen as well as the in-room washer/dryer, which were both very convenient and well-used during our stay. Being in a villa with a lock-off layout also meant that we had an additional kitchenette in the second bedroom (as this is what you would find in a studio). We took advantage of the kitchenette to store extra snacks, and drinks, and to heat-up leftovers for a midnight snack without disturbing the children sleeping in the living room area. The Two Bedroom villa we called home for the week had two comfortable and spacious bedrooms, a living space that easily accommodated us all for meals and family time (and was the sleeping space for the three kids in our party), and three well-appointed bathrooms. 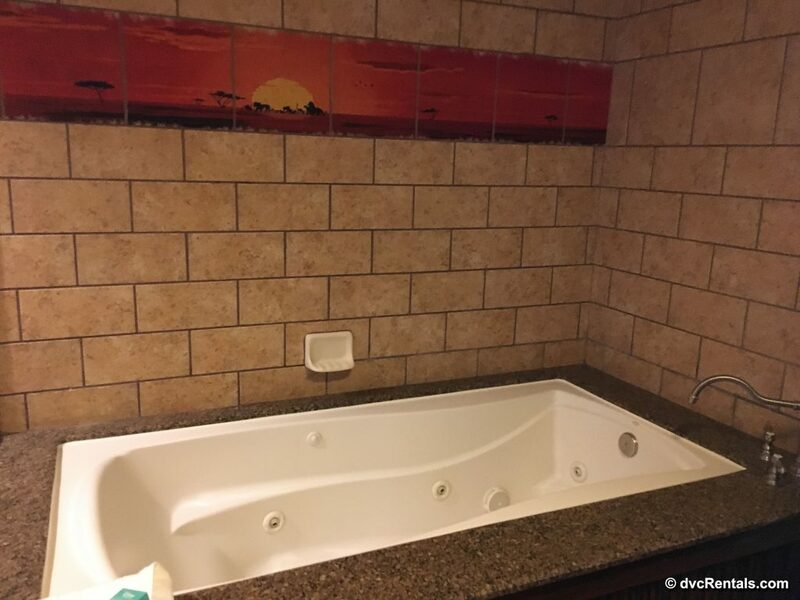 Many of the DVC resorts have two bathrooms in the Two Bedroom villas (including the villas located at the Animal Kingdom – Jambo House), so the third bathroom here at Kidani Village was a very big perk! It was easy to get everyone washed, dressed, and fed each morning, and was perfectly designed for a larger group. There was plenty of room for us to spread out and enjoy our stay! Of course, no tour of Kidani Village would be complete without seeing the on-property savannas that this resort features. 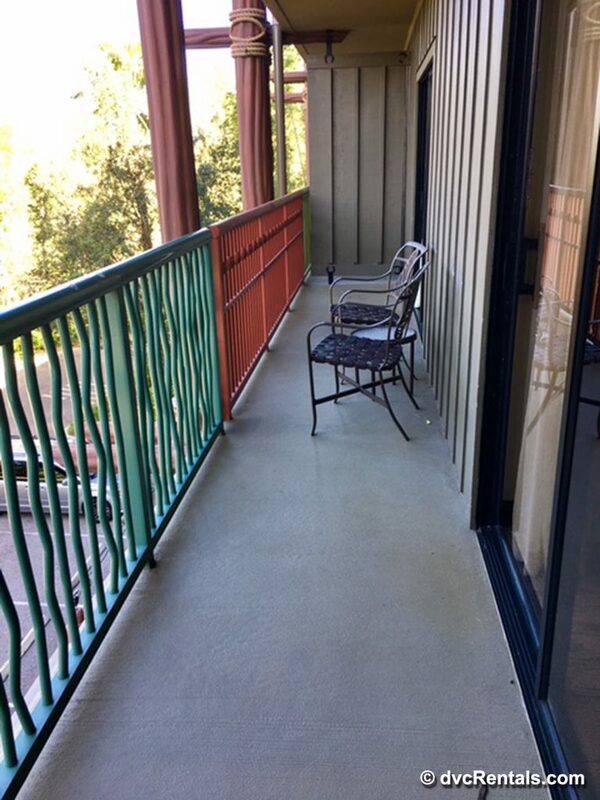 Over 30 different species of wildlife can be found around the grounds at the Animal Kingdom Villas, and there are many ways to see them! The only way to guarantee a view of the animals/savanna from your room is to book the Savanna View category. However, if you haven’t booked that view type, there are several public viewing areas as well. 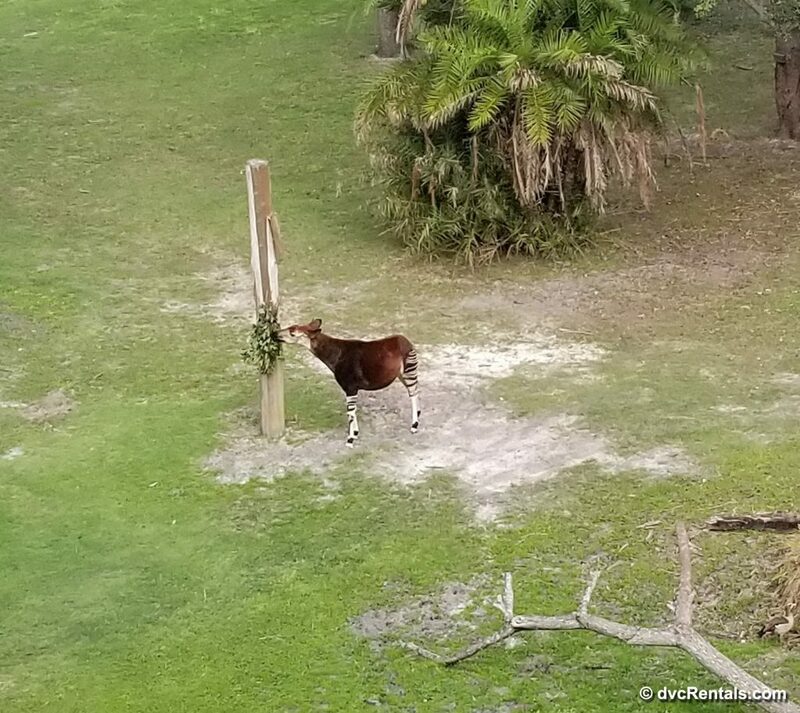 As many of the animals are encouraged to roam around, I would suggest checking out a few of the different viewing points to see a larger variety! The Kidani Village side of the Animal Kingdom Villas features two different savanna areas: the Sunset Savanna, and the Pembe Savanna. The Pembe Savanna covers six acres and features okapi (a very rare and shy relative of the giraffe), impala, spur-winged geese, red river hogs and more! The Sunset Savanna is larger and features ostriches, zebras, giraffes (my personal favorite), as well as many other species. 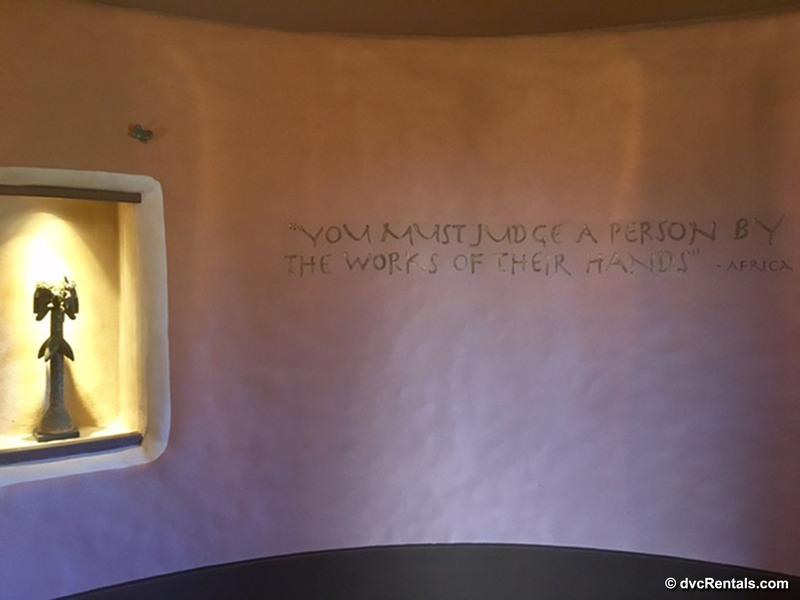 Guests of the resort can find animal identification guides in their rooms, as well as in the public viewing areas around the property, and specialty tours can be booked through Disney as well. Many of the viewing areas also feature lovely rocking chairs, and I very much enjoyed taking a quick break to sit a spell with a cold drink and enjoy the beauty of the savanna surroundings! This brings our tour to an end for today! 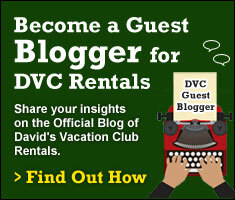 I hope you all enjoyed our expedition through the Animal Kingdom Villas – Kidani Village!